HandKrafted by Stephanie: PDCC One Year Anniversary!! Hello! Today we are celebrating the One Year Anniversary of the Play Date Cafe Challenge with PDCC52! Julie invited a few PDCC alumni to come back and play along, and of course I said yes! She chose a beautiful pastel palette (see above), which is open to your interpretation. I used light yellow, pale peach, light pink and white. This special challenge is sponsored by Unity Stamps and Cosmo Cricket. In addition, the Unity DT will be playing along. Each day of this week's challenge until the challenge deadline (next Tuesday at midnight EST), the PDCC blog will spotlight some creations by the Unity design team. You won't want to miss any of it! With all the fall and Christmas cards that I have been making, this was a refreshing color combination for me to work with! I used one of the newest Verve sets, Many Blessings. I stamped the smallest flower 3 times, then I added the sentiment on the same panel. I pieced the flowers with the same Bitty Dot patterned paper, added the same colored pearl to the center and added some light green to the leaves. For my layout I used one of Mercy's sketches from a few weeks ago, MTSC94. 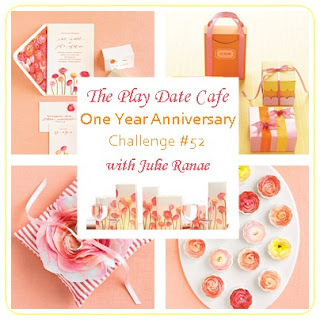 Be sure to visit the Play Date Cafe blog for more details on this anniversary challenge and to see all the designers' creations! Accessories: Long Rectangle Nestabilities (Spellbinders), Markers (Copic), Pearls (Prima), Seam binding ribbon, Foam tape, Thread, Sewing machine. Such a darling card! I love the polka dot paper! What a sweet card Stephanie! Love the little blossoms with the pearl centers! Wonderful use of this weeks colors. Love the trio of flowers with the added pearl centers. Thanks for celebrating with us in the Cafe! I agree, as much as I love all the fall colors, it is refreshing to see such lovely springy colors :) I LOVE the stitching on this, such a pretty card! Oh this is so sweet and pretty! Beautiful Stephanie! Love all the wonderful stitching and fabulous dps! Your design is elegant and clean...just gorgeous! Glad to have you playing along with us at the Play Date Cafe in celebrating our 1 year anniversary!